I have noticed that August hasn’t been a very active month in the HYIP industry. Most likely because people were on holidays enjoying last bits of the summer. Today I will examine the latest rival on DavidNews monitor – a program Altenergy Ventures Group, which joined Standard listing on the 28th of August. I have reinvested into this program $200 and will keep an eye on it during the following weeks. The website has been built using HYIP website script provider H-Script. It’s an alternative to Gold Coders script, which is built for Russian speaking audience because the website is located on the .ru domain and its main version is in Russian. Altenergy Ventures Group website has a standard website layout with major information available out there in 8 languages including English. Can’t tell you much how precise these translations are. Feel free to drop your comment in the chat box and let us know if it’s a Google Translate or a human translated text. In my opinion, the homepage of the website is well done and provides all the most important information for the potential investor. Of course, first-time visitors might have a difficulty understanding what’s this website about. However, people familiar with HYIP industry shouldn’t have any difficulties. Information about the investment plans is placed on the top of the page, which I find very convenient. Moreover, there are only 4 plans. I will explain more about them in one of the following paragraphs. Second, the calculator is also located on the homepage and we can calculate the potential benefit without leaving the first page. Third, HYIP facts like amount deposited and withdrawn profit are also located here. Keep in mind that there is no way to check this information and any numbers can be presented to us. I did take a closer look at the company biography page to learn the legend of Altenergy Ventures Group. It positions itself as a company investing in the alternative energy. What a surprise, right? Of course, each time I read HYIP legends I ask myself – why would a successful businessman create a HYIP website instead of going to investors? Unfortunately, I can’t find an answer to such question and most likely will not find in the future. Therefore, let’s try to find out what are the potential benefits this program is promising to potential investors. Almost forgot to mention – company has a company registration certificate – a copy of it and a link to Companies House website where information about the company Altenergy Ventures Group LTD can be checked. 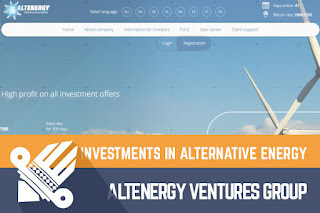 Altenergy Ventures Group is offering 4 investment plans. It’s easy to get confused about the profit, because for two plans – profit is shown per day, third – per week, fourth – per month. Minimum deposit varies starting as low as $25 up to 50001. Another funny thing – time of the deposit is mentioned in days for 3 plans, but for one of them – in weeks. Deposit is included in the payments for most of the plans, except the last one. I mentioned these things to make sure you pay attention to all details when comparing plans. As you see, information can be confusing sometimes, because it is presented with different values. In my opinion, the only first plan looks realistic due to its minimum deposit and all other plans are quite risky due to the high stakes. For example, a deposit of $200 would reach its break-even point only after 84 days, which means that deposit is starting to generate the revenue only from the 85th day, which of course is quite a long time. In case the program will manage to survive for 300 days the potential profit would be $520. However, it’s a very long term. This HYIP has been already working for 47 days, which is not much for low return project, but as we know it is difficult to predict anything these days. Even though standard website layout is present on the website, graphics and images looks unique. Admin is trying to attract investors from different countries by implementing 8 different translation. Moreover, there is a company registration information available on the website. It looks to me like a long-term project, which requires a long time to make a profit. On one hand – we don’t know what will happen to it after two weeks, on the other hand – it’s easier for admin to pay such low-interest rate in the long term. Especially, when the most realistic plan is not offering the return of deposit at the end of the 300 days. At the moment, I don’t see anything unusual about this project nor in a positive or negative way. It looks pretty much a standard, but low return HYIP. Keep in mind that there are no objective factors to assess any program and it’s impossible to predict its performance. Therefore, if you ever decide to make any investments, don’t invest more than you can afford to lose! Investment plans: 1.2% daily for 300 days, initial deposit included in the payments. Ignore other investment plans. Join Altenergy Ventures Group Here!